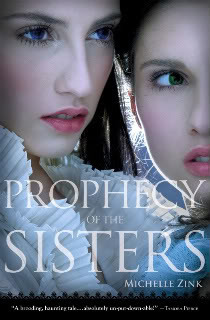 An ancient prophecy divides two sisters--one good, one evil. Twin sisters Lia and Alice Milthorpe have just become orphans. They have also become enemies. As they discover their roles in a prophecy that has turned generations of sisters against each other, they find themselves entangled in a mystery that involves a tattoo-like mark, their parents' deaths, a boy, a book, and a lifetime of secrets. See that? A few hours after I have finished devouring 'Prophecy of the Sisters' and I am still this way, talking ominously and carefully as the protagonist, Lia had. She was brilliant. I will admit to my wariness at picking up a book like this, and let me explain by saying 'a book like this' refers to the ever possibility of split POV's, which frankly I am finding myself not a fan of. Some authors like Zink, can pull it off, whilst others make it a jumbled mess of redundancy. I was pleased that with this book that was not the case. Lia is insightful and deep, aware but still searching, she makes it nothing short of a pleasure to read her adventure - follow along as she solves the mystery of the prophecy. Zink does not try to rose-colour anything and clearly establishes Alice and the Beast as antagonist pointedly, but very early in the book. She doesn't play with the reader's emotions as some others might and tells it like it is quite frankly, they are facing the end of the world and Lia's twin sister very much wants her dead to achieve her own gain. And yet the book is not entirely black and white, it has shades of grey that I cannot delve into without revealing too much so I will keep my lips sealed. What drew me to this read was it's interesting plot and cover, the picture of two twins had me turning to read the blurb at the back, after that I couldn't resist borrowing this from the library and I am saddened to say I do have a regret, that I did not in fact buy read this instead. It would make such a great addition to the books I own already and I have it on my to-buy list, ready for when I should visit the glowing Haven of book Abodes. aka, Chapters. I want this book because it was consuming and absolutely un-putdownable, the characters were REAL. The ties chilling and engrossing. There was mystery and the best dose of romance suited to a book such as this, it was not overdone and purposeful. James was a gentleman and he is but one in a long line of reasons for which I will pick up my copy of 'The Gate' ASAP. I want MORE and that is why this book holds a 5 genie rating. It entertained me, stole my hours until I had turned regrettably the last page! Should you read this book? That depends, does my reaction make you feel as though you should? I hope the answer is yes. 5/5 genies!